There are many other things CNN, MSNBC, Fox News and all the rest don’t want you to know about Juan Guaidó. For example, until he named himselfpresident, 81 percent of Venezuelans didn’t even know who he was, according to a poll conducted by the Venezuela-based firm Hinterlaces. And he only won his own assembly seat with 26% of the vote. In order to win elections in any country, you often need more than 30 percent of the people to have heard of you. 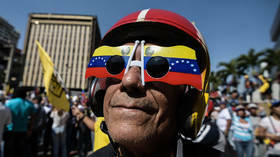 Pauly Shore has more name recognition among Venezuelans than Juan Guaidó.